HALF DAY - An up-close and personal look at the Poudre River! 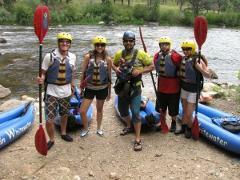 Our most popular Inflatable Kayak trip that runs fun class II and III rapids with great canyon scenery. Perfect for beginners, teens and families! Great class II, III & IV rapids! Step it up for an unforgettable experience!Run the Bridges Section of the Cache la Poudre River in an inflatable kayak. The rapids on this trip provide a greater challenge than the Filter Plant trip.